Cystic diseases of the kidney are common in infancy and childhood. These include multicystic dysplasia, autosomal dominant polycystic kidney disease (ADPKD), autosomal recessive polycystic kidney disease (ARPKD), cysts associated with hereditary syndromes such as tuberous sclerosis and von Hippel–Lindau disease, glomerulocystic kidney disease (GCKD), and neoplastic cysts. The prognosis and pattern of inheritance of these diseases differ vastly. Therefore, accurate diagnosis is important for appropriate management, long-term outcome, and genetic counseling of the family. Glomerular cysts are defined as dilatation of the Bowman's space, two to three times greater than the normal size. The term glomerulocystic kidney refers to a kidney with >5% cystic glomeruli. GCKD is an unusual lesion mimicking ARPKD on gross examination. GCKD in most cases has familial inheritance and is sometimes considered to be an expression of ADPKD in young children. Here, we present three cases of GCKD, two diagnosed on nephrectomy specimens and the one on a perinatal autopsy. A 2-month-old male infant presented with enlargement of one of the kidneys detected on prenatal ultrasonogram (USG). It measured 6 cm × 5 cm × 4 cm and the other kidney appeared to be normal. A diagnosis of cystic disease of the kidney was suggested. The child underwent unilateral nephrectomy. On gross examination, the kidney maintained its reniform shape. The cut section revealed multiple cysts, measuring 0.2–0.4 cm, involving mainly the cortex [Figure 1]a. Microscopic examination revealed several large cysts primarily in the cortex with relative sparing of the medullary region. These cysts were lined by flattened epithelium with collapsed glomerular tuft at one pole, and there was scanty interstitium. The Bowman's spaces were uniformly dilated. Glomerular tufts were rudimentary [Figure 1]b, [Figure 1]c, [Figure 1]d, [Figure 1]e, [Figure 1]f. Dysplastic elements were lacking. The blood vessels and the ureter were normal. Based on these features, a diagnosis of GCKD was made. The liver was found to be within normal limits on USG. On a 10-month follow-up, the other kidney and the liver were unremarkable. His urea and creatinine levels and other growth parameters were within normal limits. Ultrasonography-aided screening of the parents, grandparents, and other family members was suggested to rule out ADPKD, which revealed bilateral renal cysts and cysts in the liver in one of the grandparents. The family was referred for further genetic studies. A very low birth weight female neonate (1200 g) was born at 32 weeks of gestation. The antenatal USG showed severe oligohydramnios and bilateral multicystic kidneys. The neonate developed respiratory distress and died 8 h after birth. An autopsy was performed with proper consent. No obvious external malformations were detected. The kidneys were normal in size and reniform in shape and had multiple fine cysts varying in size from 0.2 to 1 cm. Microscopic examination showed the presence of bilateral GCKD involving >50% of the glomeruli. Collapsed glomerular tufts and indentation at the vascular pole were noted in majority of the cysts [Figure 2]a and [Figure 2]b. The lungs were hypoplastic. Representative sections from other organs including the liver were unremarkable. However, screening of the family members for telltale signs of ADPKD could not be done. A 6-month-old male infant presented with fever and dysuria. On ultrasound, the right kidney was nonfunctioning. He underwent unilateral nephrectomy. On gross examination, the kidney measured 7 cm × 6 cm × 5 cm with features of hydronephrosis and thickened renal pelvis and calyces. The outer surface had several small cysts (<5 mm). Microscopic examination revealed features of pyelonephritis and glomerulocystic change affecting approximately 25%–30% of the glomeruli [Figure 3]a, [Figure 3]b, [Figure 3]c, [Figure 3]d. A diagnosis of obstructive uropathy with chronic pyelonephritis and glomerulocystic change was made. The child is doing well on follow-up for 1 year. The other kidney and the liver were within normal limits on ultrasound. GCKD is an uncommon cystic renal disease of infancy and childhood. Glomerular cysts can be a morphological expression of a spectrum of heritable and nonheritable syndromes. Therefore, search for the etiology is important. Besides, due to the decreasing rates of pediatric postmortem examination worldwide, this entity is now seldom reported. This condition was first described as an isolated abnormality by Roos in 1941. Taxy and Filmer proposed the term glomerular cystic disease in 1976. Bernstein defined glomerular cyst as dilatation of Bowman's space two to three times in the plane of section and occurrence of glomerular tufts within 5% of cysts. Majority of GCKD are bilateral and are reported on postmortem specimens. However, there are only a few case reports available in literature describing unilateral GCKD and in surgical specimens. Glomerulocystic kidneys can be broadly categorized into three major groups: (1) GCKD associated with nonsyndromic heritable and sporadic forms, (2) glomerulocystic kidneys in heritable malformation syndromes, and (3) glomerular cysts in dysplastic kidney. 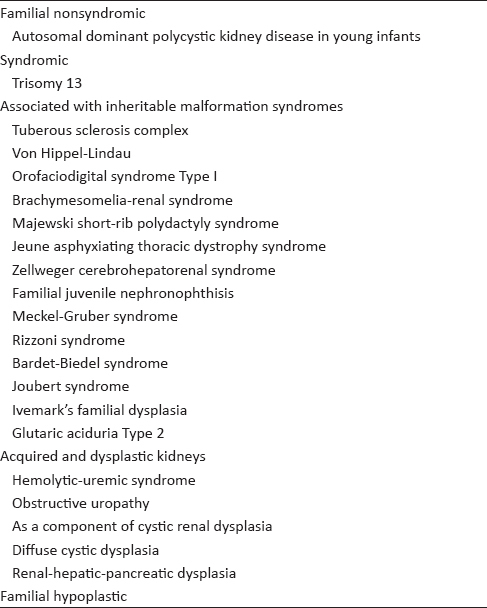 Some of the hereditary syndromes associated with GCKD are tuberous sclerosis, von Hippel–Lindau syndrome, orofaciodigital syndrome type 1, brachymesomelia–renal syndrome, trisomy13, Jeune asphyxiating thoracic dystrophy syndrome, Zellweger cerebrohepatorenal syndrome, familial juvenile nephronophthisis, Meckel syndrome, and Ivemark's familial dysplasia [Table 1]. Gupta et al. have reported GCKD in association with tracheoesophageal fistula and megacystis-megaureter syndrome. Besides sporadic occurrence, GCKD is also a common expression of ADPKD in very young children., Neonatal GCKD may actually antedate the appearance of ADPKD in one of the parents or grandparents. However, what percentage of GCKD in infants turns out to be an expression of ADPKD is uncertain. Studies by molecular tests have revealed the same genetic linkage to chromosome 16 as in adult ADPKD. GCKD phenotype in some families also results from a dominantly acting mutation that involves a genetic locus distinct from the ADPKD loci. The morphology of the affected kidney shows the presence of glomerular cysts and dilatation of Bowman's spaces with no evidence of cysts in the rest of the nephron. Our case 1 is likely to be a case of neonatal manifestation of ADPKD in view of the positive family history and USG findings in one of the grandparents. Thorough investigation of the family with screening tests including ultrasound examination of the parents and grandparents of infants with GCKD, accompanied with DNA-probe analysis, is important to exclude ADPKD. The diagnosis of ADPKD is generally made on renal ultrasound which is a sensitive method used for screening. Age-dependent criteria based on cyst number have been derived for this purpose. Screening studies may also reveal cysts in the liver. Hepatic cysts increase in frequency with age as found in the CRISP study. Bilateral renal cysts and cyst in the liver in one of the grandparents in our case I was a strong pointer toward ADPKD. GCKD can closely resemble the gross pathology of ARPKD. However, microscopic examination of GCKD is quite distinct from ARPKD. Cysts involving the collecting ducts of the medullary region are not seen in GCKD. The glomeruli in ARPKD are normal. Congenital hepatic fibrosis, ductal plate malformation, and Von Meyenburg complex as seen in ARPKD have not been reported to be associated with GCKD. While most cases of ARPKD die in infancy, cases of GCKD commonly survive into adulthood; hence, it is important to make the correct diagnosis for appropriate management. GCKD has also been found to be associated with other acquired causes such as tubular obstruction as seen in our case III. This link between obstructive uropathy and development of glomerular cysts may be attributed to transcription and developmental gene regulation. This is an acquired cause of GCKD where the renal cortex on the obstructed side exhibited glomerulocystic change. GCKD is a morphologic term describing renal abnormality in some case of childhood ADPKD, tuberous sclerosis, and other syndromes. Distinction from ARPKD on prenatal USG screening is difficult. Majority of cases of GCKD have been reported on postmortem examination, and reports on biopsy are few. Our cases represent this uncommon entity, which should be diagnosed correctly for appropriate clinical management, prognostication, and genetic counseling. USG screening of the family is suggested to exclude ADPKD. Gene-based mutation screening or DNA linkage analysis is to be considered in individuals in whom imaging result is equivocal. The authors certify that they have obtained all appropriate patient consent forms. In the form, the patients have given their consent for their images and other clinical information to be reported in the journal. The patients understand that their names and initials will not be published, and due efforts will be made to conceal their identity, but anonymity cannot be guaranteed. Lennerz JK, Spence DC, Iskandar SS, Dehner LP, Liapis H. Glomerulocystic kidney: One hundred-year perspective. Arch Pathol Lab Med 2010;134:583-605. Bernstein J. Glomerulocystic kidney disease – Nosological considerations. Pediatr Nephrol 1993;7:464-70. 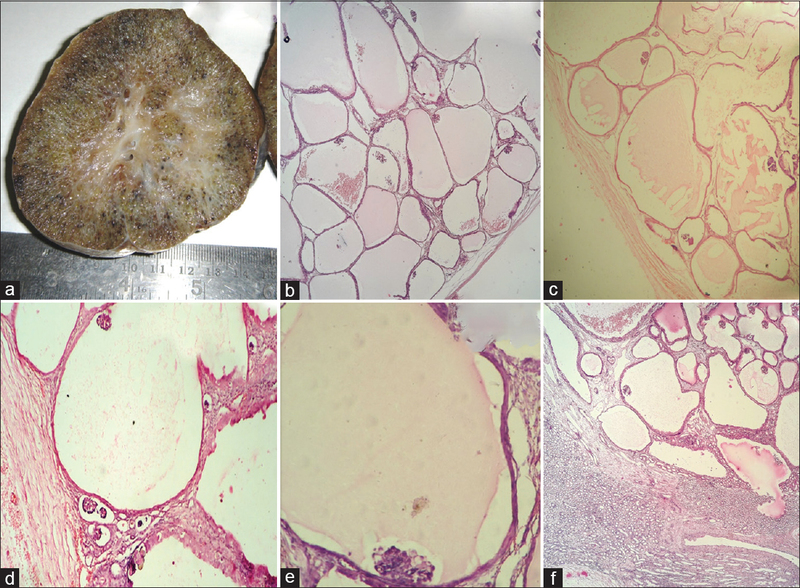 Roos A. Polycystic kidney: Report of a case studied by reconstruction. Am J Dis Child 1941;61:116-27. Taxy JB, Filmer RB. Glomerulocystic kidney. Report of a case. Arch Pathol Lab Med 1976;100:186-8. Vijayakumar M, Prahlad N, Nammalwar BR. Glomerulocystic disease. Indian Pediatr 2006;43:434-7. Bissler JJ, Siroky BJ, Yin H. Glomerulocystic kidney disease. Pediatr Nephrol 2010;25:2049-56. Gupta K, Vankalakunti M, Sachdeva MU. 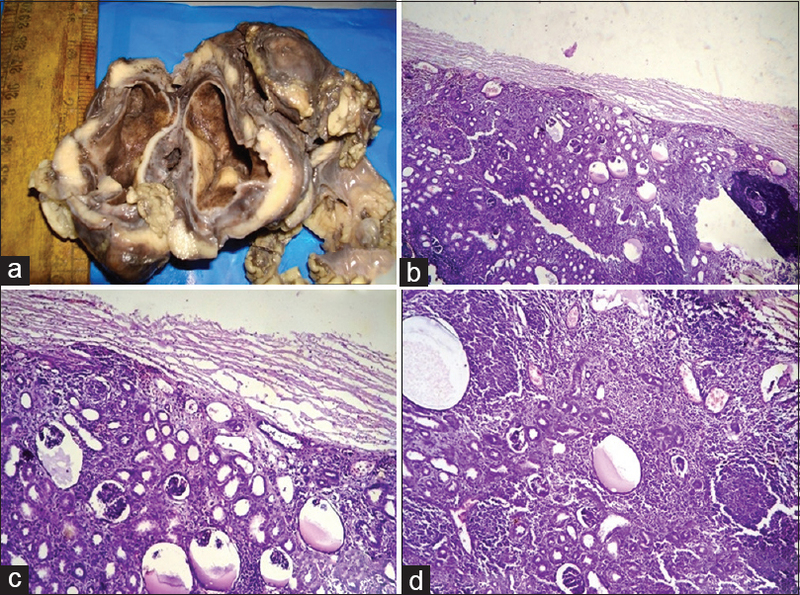 Glomerulocystic kidney disease and its rare associations: An autopsy report of two unrelated cases. Diagn Pathol 2007;2:12. Taitz LS, Brown CB, Blank CE, Steiner GM. Screening for polycystic kidney disease: Importance of clinical presentation in the newborn. Arch Dis Child 1987;62:45-9. Ceccherini I, Lituania M, Cordone MS, Perfumo F, Gusmano R, Callea F, et al. Autosomal dominant polycystic kidney disease: Prenatal diagnosis by DNA analysis and sonography at 14 weeks. Prenat Diagn 1989;9:751-8.